How long will this last, the pain after surgery has been done? I am at three weeks today. I am getting tired of the pain I go through, EVERY SECOND OF THE DAY!! Please, help me. Can anyone tell me how to cope with the pain, when it is so severe? 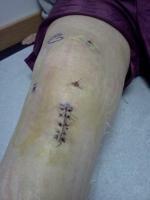 I had Lateral Retinacular Release surgery done on June.18,2008. I don't really understand this surgery either. Can you help me,please!!! I am at wits end on not knowing anything about this surgery.